How do I make a reservation and book my event? Complete the ‘Service Form + Agreement’ and send with $150deposit. Final payments made by check or credit card must be made 5 days before the event. If you are paying by check or credit card, the final payment is due 1-week prior to the your event date. This allows us to process payments and ensure they clear prior to your event. If you are paying in cash, your final payment is due on the day of the event. What do I need to provide Photo Ops to setup the photo booth? 7-8 ft height clearance for backdrops. 10 ft clearance for swerve booth. Electrical Power (110V, 5 amps, 3 prong standard outlet) is available within 40 feet. For outdoor events, we will need client to provide a power generator. It is an additional $195 for Photo Ops to provide a generator. Invitation or graphics for design of the template. You may email invitation or mail with reservation form. Access passes for events being held on a military base. Do you set up at outdoor events? Yes. For best results, we require the booth to be under a tent or near a covering. Area must also be away from direct sunlight, gusts of wind, and water. We will arrive 45-90 minutes prior to the photo booth start time. Does the rental time include setup and breakdown? How long do you need to breakdown? 20-45 min for 1 service. 30-60min for multiple services. How far will you travel and is there a travel fee? Photo Ops will travel anywhere on Hawaii. There is an additional travel fee to the North Shore of Oahu ($100) and outer-island events (please contact us for quote). We’ve serviced events on the Big Island, Maui, and Kauai. Will there be someone on duty to assist our guests with the photo booth? Yes. 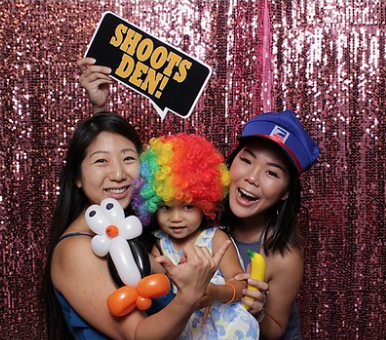 There will be 1 or 2 photo booth assistants at your event. Our props are hand curated for your guests to have fun with. We have cool hats, signs with silly slogans, Hawaii themed props, large glasses just to name a few. We are always growing our collection. Prop choices vary with the event theme. How many prints will our guests receive? All of our photo booth packages come with UNLIMITED PRINTS by request of the guests (e.g. group of 6 people wants 4 prints, we will make 4 prints). What size are the photo prints? The final size is a standard 4x6 print or 2x6 photo strip. What is a personalized print design or template? We will create a template using your party’s theme. Feel free to send us your logo, invitation, or any graphics and we will be happy to design it (additional charges may apply). If you are a graphic designer and want to send in your own template, you a welcome to send us your creation. The venue requires vendors to provide proof of insurance - does Photo Ops have Insurance? Yes. We are covered with a $2M insurance policy. We will be happy to send a Certificate of Insurance to your venue’s banquet manager. Are we able to close and re-open (idle) the booth during the rental time? Yes, we will be happy to close the booth during a specific time during your program. Closing the booth does take out valuable photo time from your guests. There is a $75/ hour idle time fee.